Not all of our collection is easily placed in a case, or a frame, or hung on the wall, to be admired. (You can see those kind of things best, by coming to the Museum yourself.) But we do have other more intangible things, awkward things, things that are fussy, fleeting, smelly, or slippery, things that really can't be handled, even with white gloves. 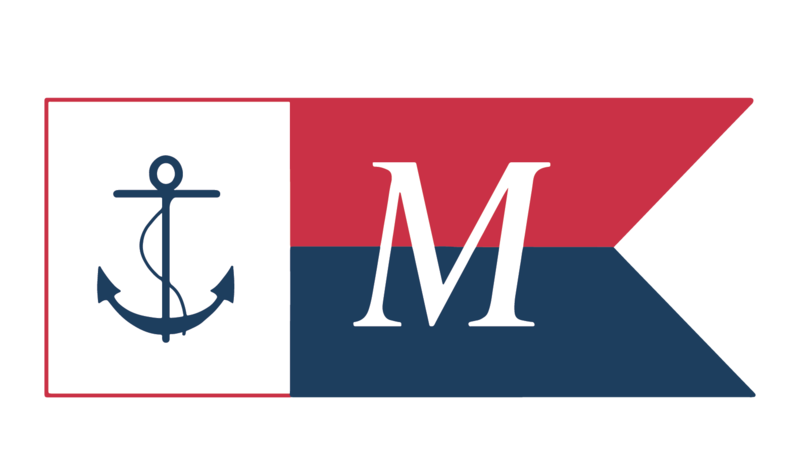 These are hard-to-find samples or actual remnants of substances that made maritime life work; the humble and generally perishable stuff that keeps the water out, the gears turning, or the constitution willing. In the maritime world, beeswax is blessed for its ability to waterproof and lubricate any thread or twine drawn across it; various sized lumps can be found in any sailmaker's or rigger's kit, well scored with criss-crossing grooves from the cordage drawn across it. 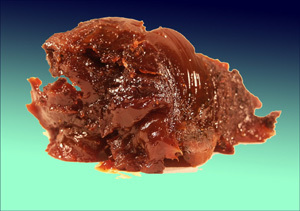 Melted into numerous concoctions, beeswax was a staple ingredient in waterproof coatings for canvas and foul weather gear. Blocks of wax the size of our large one were meant for bigger projects, like launching ships such as the Edward B. Winslow, sliding into the Kennebec in 1908 on the future site of Maine Maritime Museum (above). 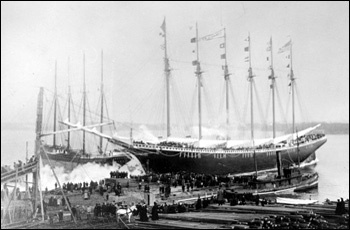 Recipes for the slip-coat that enabled several thousand gross registered tons of cradled vessel to begin sliding down the ways into the water were not treated lightly. 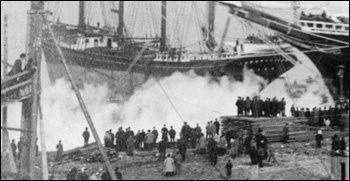 Nor was it applied lightly; to stint on greasing the ways was to risk the public ignominy of a hung vessel, instead of the eminently satisfying trail of smoke (see detail above) as the friction of the sliding tonnage caused the slip-coat to ignite. (above) This is a sample of slip-coat from the 8/12/1995 launching of the Bath-built USS The Sullivans (DDG-68). Inclined launching ways fell into disuse on the Kennebec in 2001, so this innocuous stuff has slipped into history. 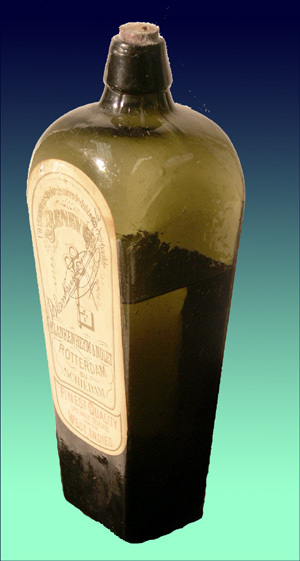 Like that one-horse open sleigh, you've probably heard of whale oil, but have you ever seen any? 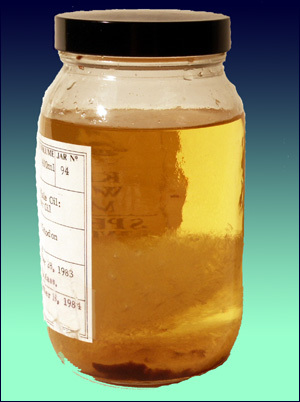 This is a sample of sperm whale oil, "rendered for scientific and educational purposes from specimens recovered under supervision of the United States Government," from a whale that washed ashore at Truro, Mass. in 1983. Despite the precipitate in our jar, the oil's clarity and almost water-like viscosity shows why it not only lit lamps, but also lubricated clockworks, microscopes, and other delicate machinery. It has no fishy odor, smelling faintly like linseed oil. 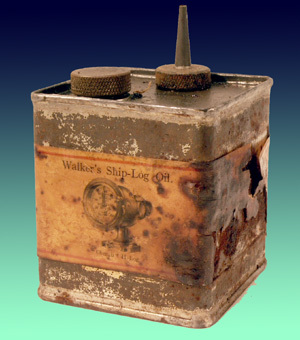 It is possible that the full tin of Walker's Ship-Log Oil (below) tucked into this taffrail log kit (above) contains whale oil to lubricate the speed indicator head (missing), though the print of the box label dates this device closer to 1900, and well into the era of petroleum-based oils. 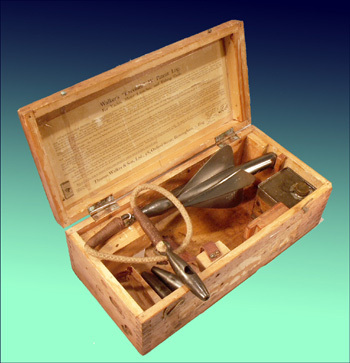 Either way, the manufacturer is insisting on keeping the tin close at hand in the box's corner pocket, to keep the whirling gears well oiled and running accurately in salt-water conditions. 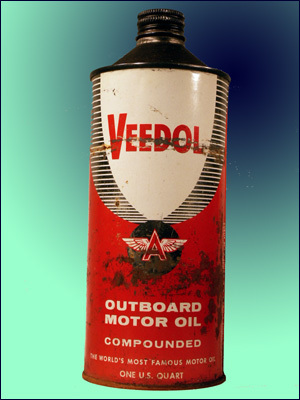 An unused can of circa 1960 outboard motor oil may seem mundane and unappealing compared to whale oil, but both substances are receding into the past at the same rate. We just haven't reached the end of the petroleum age, yet. I would argue that the oil in the can, rather than the can itself, is ultimately the more ephemeral artifact. What wouldn't we give for an un-opened keg of whale-oil? 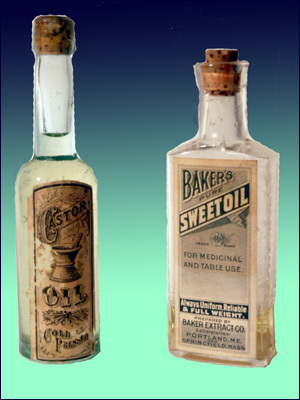 Two other oils commonly found in sea-going medicine chests that have largely dwindled into folklore: the purgative castor oil, which still figures iconic-ly in cartoons; and the emollient sweet oil, which was often olive oil before it became so prominent in present-day cooking, and seems to be called almond oil these days. 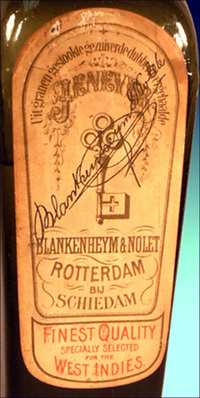 But to keep to the substance of my presentation: jenever is historically a different drink from the present-day gin that is its descendant, as any Dutch barkeeper will remind you. The clear liquor sealed within our bottle (if it isn't seawater!) is presumably of distillogical (words fail me) historical value, an artifact in its own right.